Our mission is to empower inmates to grow in discipleship and accountability through an interactive Bible study, and to provide the opportunity to build healthy relationships through God's Word as they prepare to re-enter society. The intention is to have our Missionary make presentations of this ministry in the local churches in Western PA asking for prayer, leadership, and financial support. The goal is to eventually have the ministry primarily funded by the local churches as we move out into the many prisons in Western PA.
We continue collaboration with Prison Fellowship Ministry in order to help provide after-care for the inmates who have completed our program and are being released. Another aspect of the ministry is to provide supplies for children and youth leaving shelters or detention centers in Western PA including a backpack with a puzzle book, toiletries, and a prayer bear. We are also striving to find nursing home placement for the elderly inmates who have completed their sentences and need special care. 2. To help come against the detrimental forces that the men, women and youth in prison have to deal with, and to help them grow spiritually and in accountability. 3. To continue working on designingshorter term study programs for the County, State and Youth prisons. 4. To gain access to even more facilities for Women, Juveniles and Hispanics in Western PA.
5. To involve more trained laity, pastors and inmates as Volunteer Leaders in the prisons. 6. To address the literacy and language issues in the choice of Bibles and study materials. 7. To involve Districts, local churches and individuals in prayer, financial support, and in providing volunteers to enter the prisons on a weekly basis to study and pray together with the inmates. 8. To continue to assist in providing relational after-care and clothing and information on churches for inmates preparing for release . 9. 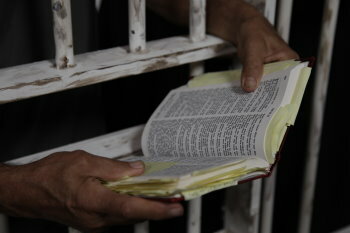 To train inmates in leadership skills to lead Bible study classes in their prisons. 10. To collect bags, crayons, craft supplies and clothing and puzzles for youth, children and women in detention centers in Western PA.